The experience of infertility is often all encompassing and at times debilitating. If this sounds familiar, please know that what you are feeling is completely normal. There are tools you can use to shift your life into a more positive place despite the uncertainty and the constant desire of wanting something you don’t yet have. When our minds focus on our limitations and the need to fix the problem, we strengthen the idea that we are not ok the way we are. 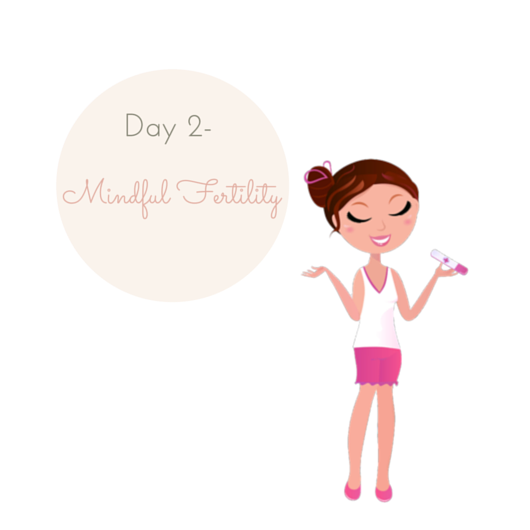 Mindful Fertility techniques are powerful tools that can help shift the way we experience ourselves and combat our own negative self-judgments. Eliciting a feeling of acceptance, even for just for just a moment, alters our bodies on a physiological level. It also changes the way we experience life and relaxes both our body and mind. Are you able to elicit a feeling of acceptance? Even for just a moment? Practicing Mindfulness: the 3 A’s – Awareness, Acceptance and Action. Let’s use the example of feeling upset when you see a woman who is holding a newborn baby to work through this exercise. Notice your thoughts and check in to see how you are feeling. Perhaps you can get a sense of how those feelings show up in your physical body. Acceptance is such an important step, and it’s one that most people skip over. They end up holding negative emotions like anger and guilt in the physical body. Then they turn to self-judgment, and the self-defeating cycle continues. Sometimes Step 2, Acceptance, is the Action step. There will be times that the process of making peace with your thoughts and feelings is enough to soften the negative emotions. Other times you will need to take action. It is important to choose the action steps that work well for you. I like that you say its ok to feel guilty about saying or thinking these thoughts but I feel so terrible afterwards. So I realize I need a journal until then I will be practicing inhaling and exhaling. A journal is a great idea! Even notes on your phone during the day…it doesn’t have to be fancy just being able to experience it, put it down writing and then let it go, either by deleting it at the end of the day or looking back on it the next day and truly feeling like you’ve moved on! Guilt can not survive with empathy and self love!